India stands at the intersection of technology and history. Home to more than 1.25 billion people, it is struggling to build a modern society in the midst of a culture that has changed little since the age of feudalism. One of the keys to economic prosperity is access to reliable, affordable electrical power. Many developing nations have chosen to fuel economic expansion by building coal fired generating plants. Coal has traditionally been one of the least expensive fuels and is found in abundance worldwide. But now solar power is starting to edge out coal as the power source of choice as costs continue to plummet. At first, India followed the lead of China, which built the largest manufacturing economy in the world by constructing hundreds of coal fired generating plants. But China soon discovered burning all that coal made for smog filled skies over its major cities. India paid attention to the gathering storm of human health concerns in China and decided to hold off on building more coal facilities. It chose to invest in solar farms instead, which is good news not only for India but for the global environment as well. The Kamuthi solar farm produces 648 megawatts of electricity but here is the astonishing part. It was completed in just 8 months. Not only is solar power inexpensive and getting cheaper, a complete solar installation can be completed in the shortest possible time — a critical factor for countries like India where large portions of the population have no access to reliable electrical energy. It cost $679 million to build, which is a small fraction of what a comparable coal powered or nuclear generating plant would cost. A nuclear power plant today can take 9 years to design, build, and get operational. Jaain says that the town of Kamuthi is a perfect location for solar power generation. “For such a mega-sized solar power plant, we required a huge patch of land. Also, it needed good solar radiation and a proximity to the port for logistics purposes. 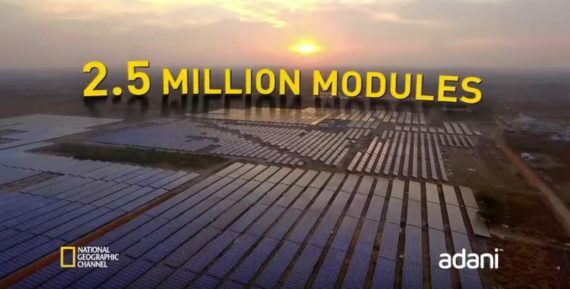 All this we found at Kamuthi in Tamil Nadu.” By 2022, India plans to power 60 million homes with solar energy. That could make India a world leader in renewable energy generation. Adani is confident it can play a major role in making that plan a reality. “We plan to produce 11,000 MW of solar energy in the next five years,” he says. To see how enormous the Kamuthi solar farm is, be sure to watch the video below.